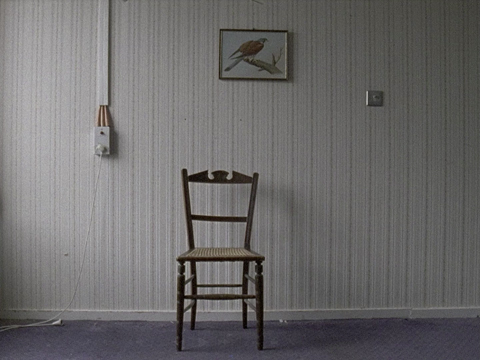 A 16mm film conceived in the format of a TV play and set in a seniors’ care home. Part documentary, part fiction, the script for the film was a collaboration with writer and critic George Clark and was constructed from verbatim transcripts of a discussion group held over a period of five months with the residents of four care homes in Camden, London. Taking B. S. Johnson’s 1971 experimental novel House Mother Normal as its formal departure point and employing the structural logic of a musical score, the script is edited into a vertical structure, in which eight voices or eight monologues occur simultaneously. The Future’s Getting Old Like The Rest of Us features actors Roger Booth, Corinne Skinner Carter, Janet Henfrey, Ram John Holder, Anne Firbank, John Tilbury, Jane Wood, and William Hoyland; the latter starred in B. S. Johnson’s films You're Human Like the Rest of Them (1967) and Paradigm (1969). Commissioned by the Serpentine Gallery, London, as part of the Skills Exchange project, in which artists swap skills and develop ideas for social and architectural change with the elderly, care workers, and young people (adapted from LUX, London). Colour, 16mm to HD. 48 mins. Beatrice Gibson (b. 1978) is an artist based in London. Investigating ideas around voice, speech, collective production, and the problems of representation, her films deploy notation and conversation as paradigms for their production. Gibson’s film A Necessary Music, made in collaboration with composer Alex Waterman, won the Tiger Award for best short at the Rotterdam Film Festival in 2009. Her recent solo exhibitions include “The Tiger's Mind,” presented at Künsterlhaus Stuttgart in 2010. She is currently working on a new publishing project with editor and typographer Will Holder. Distributed by LUX artists moving images.